How many of you want to get blessed in this year? If your answer is yes, you need to have a forgiving heart which is the heart of God in order to get blessed by God and to be a blessing to others. Why God cannot bless unforgiving people? 1) Matthew 6:7-9, 12 -> Only when we have a forgiving heart, we will have the confidence to ask God to forgive our wrong doings. This confidence that you will have in God is faith. So the level with which you can forgive others also depends upon the capacity of your faith, the more you have confidence in God the more you will forgive others (Luke 17:1-6; Mark 11:22-26). 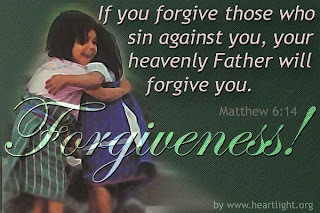 2) Matthew 18:34 -> If you don’t forgive, God will deliver you to the devil that will torture you without peace (v35). This will happen until you take a decision to forgive all others whom you have grudge with and have a heart of forgiveness in you. Ex: Story of a little boy dying in sickness. 3) Eph 4:26-27, 29-30, 32.
a) Be angry, do not allow that anger to continue. If you allow it, you have already given place to the devil. b) You will grieve the Holy Spirit and slowly you will lose hearing his voice. c) Slowly you will start speaking badly about others and even yourself. d) Only hurt people will hurt others. Ex: The Story of a little boy who said to his mommy, “How can I keep the sun from going down?”(Eph 4:26). e) We are responsible for our own attitudes. f) The will of God is that, you become more and more like Christ [not the devil]. a) Jesus said, “…whoever is angry with his brother or sister without a cause will be in danger of Judgment [verdict when found true is equal to murder]”. b) Every murder happens because of unforgiveness and jealousy. Ex: The story of a man who died and came back alive. 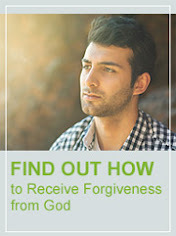 c) Unforgiveness is like drinking poison and expecting others to die. 5) Matthew 6:14, 15 -> If you do not forgive men their trespasses, neither will your Father forgive your trespasses [Our loving Father is also the God of justice (Malachi 2:17)]. 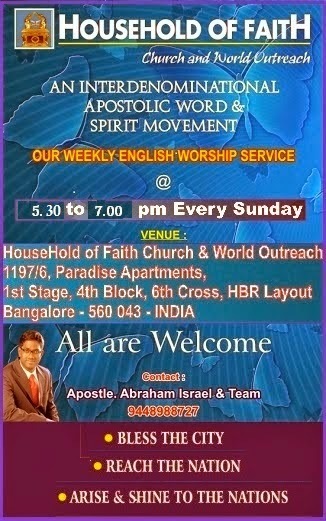 Receive the heart [mind] of Jesus Christ [where? It is already in the inside of us. Then? Only believe and obey the word and the voice of God] and live a life-style of forgiveness. You will surely be blessed by God when your life style is patterned like this with forgiveness rooted deep in your heart as the basis of your relationship with people and with God. Be blessed to the full and overflowing with your heart of forgiveness!